Williams' new head of vehicle performance Rob Smedley believes that his new team need to "cut out all of the slack" and work "on a knife edge" in order to succeed this season. Speaking after this weekend's Chinese Grand Prix, Smedley explained how both Felipe Massa and Valtteri Bottas's cars survived early collisions, and what happened during Massa's ill-fated pit stop in which the wrong tyres were fitted to the rear of his car. 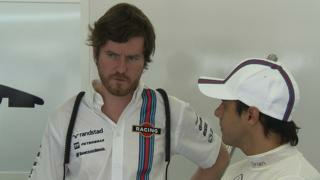 Smedley joined Williams at the start of the 2014 season, having spent eight years as a race engineer at Ferrari.